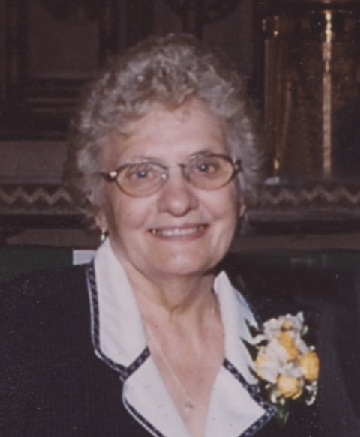 Delphine E. “Del” Nietfeld, age 86 of Greenwald, died unexpectedly on Sunday, March 24, 2019 at the CentraCare Health Hospital in Melrose, Minnesota. A Mass of Christian Burial will be held at 11 a.m. Wednesday, March 27 at St. Andrew’s Catholic Church in Greenwald with Rev. Marvin Enneking officiating, Rev. Kenneth Popp and Rev. Mark Willenbring concelebrating. Interment will be held in the parish cemetery. Visitation will be held from 4 to 8 p.m. Tuesday at the Patton-Schad Funeral Home in Melrose and from 10 to 11 a.m. Wednesday at the church. Parish prayers will be held at 7 p.m. Tuesday evening at the funeral home. Delphine Elizabeth Minette was born August 22, 1932 in Sauk Centre, Minnesota to George and Mary (Zenzius) Minette. Del graduated from Sauk Centre High School. On August 31, 1954 she was united in marriage to Bernard “Benny” Nietfeld at St. Paul’s Catholic Church in Sauk Centre. Del farmed prior to their marriage and the couple took over the family farm southeast of Greenwald in 1963. In January of 1992, they retired and moved into Greenwald. She was a member of St. Andrew’s Catholic Church in Greenwald and St. Ann’s Christian Women. Del was a great cook and made enough food to feed the entire neighborhood, and even dabbled in brewing root beer. She enjoyed playing cards, playing the concertina, and visiting with her family. Del always loved sending cards and truly loved her family, especially her grandchildren. Survivors include her husband of 64 years, Benny Nietfeld of Greenwald; children, Mary (Chuck) Roehrl of Maine, Marlene (Roger) Douvier of St. Joseph, Roger (Saichon) Nietfeld of Greenwald, Dan (Jan) Nietfeld of Greenwald, Ken (Stacy) Nietfeld of Lino Lakes, Ruth Messerich of Sartell, Ron (Evelyn) Nietfeld of St. Michael, and Joe Nietfeld of Fargo, North Dakota; 16 grandchildren and 12 great-grandchildren; and sisters, Mary Mae Olson of Sauk Centre, Shirley Marthaler of Sauk Centre, and Bernice Proell of Sauk Centre. Del was preceded in death by her parents; brother, Bud Minette; and sisters, Leona Bromenshenkel and Millie Rieland. Serving as casket bearers will be Eric Messerich, Chris Messerich, Greg Douvier, Luke Nietfeld, Jeremy Nietfeld and Cory Nietfeld. Cross bearer will be Jacqui Lahr and scripture bearer will be Chloe Nietfeld. Honorary bearers will be St. Ann’s Christian Women. The reader will be Richard Lahr and gift bearers will be Ruth Messerich and Marlene Douvier. A eulogy will be read by Ron Nietfeld and Eric Messerich. A special thank you to the staff at the Senior Alternative Care in Sauk Centre for the wonderful care they gave to Del.